The kit comes in two solid, light gray resin pieces. Assembled, it's a height of ten inches, with casting duties handled by Shane McGowin. There are so many tiny spikes and spines on the surface that I feared wouldn't survive the casting process, but to my surprise, most of them did. Don't get me wrong: there were some repairs to be done, but work was minimal and easy. I remember seeing progress photos of it on a modeling forum called the The Clubhouse. Jarett must have been surreptitiously working with the piece for some time, and when he finally announced that it was his intention to produce the bust and make it available to purchase, I'm sure a group of ravenous hobbyists had their fingers hovering over the 'Pay Now' button. Examining the creature's face, I see a hint of self-satisfaction in that half smirk, but maybe it's just me. The stoic, upright position of the head works the aforementioned aspect even further into being. I think it was an excellent decision for Jarett to imbue a little personality unto the dragon instead of portraying a fire-crazed, apocalyptic wyrm. (And let me tell ya', there's absolutely nothing wrong with that, either...) But the proverbial icing on the cake is without a doubt the wonderful field of reptilian textures the sculpture boasts. I might even take it to the ledge and say that this piece boasts some of the most exquisite textures of this sort that I've had the pleasure of seeing. The whole piece is just handsome and full of pride; a combination of words which sum the piece up best in my opinion. I had to strip the bust and start all over. This piece it titled, " Surreptitious". Sculpted by Jarett Riva, a.k.a. Evilriva. I'll post finished photos as well as more details on the piece, hopefully tomorrow evening; but for now, I'll part with a few photos of the bust primed, as well as several ones showing the bust with a few early layers of paint on it. Yeah, yeah... Enough with the dramatics already. I decided that I needed a quick fix, so lucky me, I have a box filled with those excellent resin creature heads that Simon Lee has been putting out over the last 3 years. This particular one, simply titled, 'Creature Head No. 7' was the one that had the honor of being subjected to my imagination. If my memory serves me correctly, Simon actually used his Mantis creature bust as a substrate to begin this piece, and it does seem to be so, as there certainly is a semblance of that previous creature lurking in there. The head itself is no more than 2.5" tall and wide, according to Simon's website. I was always very interested in the photo of the No. 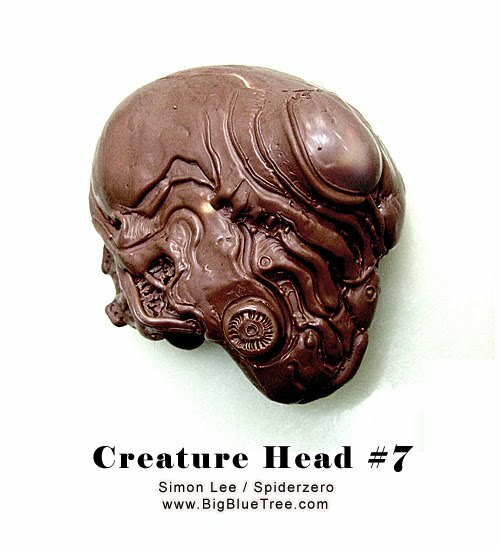 7 creature head Simon used on his website. It appeared very dark and oily; maybe some condensation steaming up the lenses, or whatever they are. So I used that photo as a launching pad. I also wanted to make a simple themed base that went along with the greasy, lubricated look I planned to give the head, so I dragged out a box that I've been stowing away random interesting looking junk in for the last ten years. After wasting time on a few doomed designs I finally arrived at a suitable look that I felt cooperated with the head, which consisted of some parts from an old clock radio, an oscillating fan and some wires here and there. Painting it was pretty simple, I just wanted the entire piece to appear very dark, grimy and unclean. I always look forward to an opportunity to get one of these little bastards out and be creative with it.